Background: There are controversies regarding the usefulness of the pyloric drainage methods after esophagectomy as well as differences among various pyloric drainage techniques. 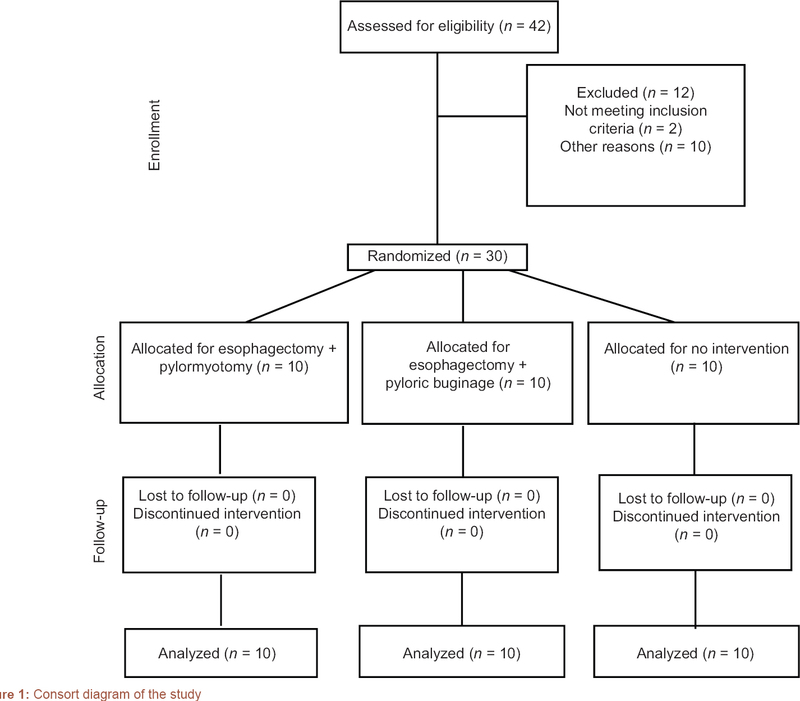 Therefore, we compared the outcome of pyloromyotomy, pylorus buginage, and no intervention methods on gastric emptying among patients undergone esophagectomy. 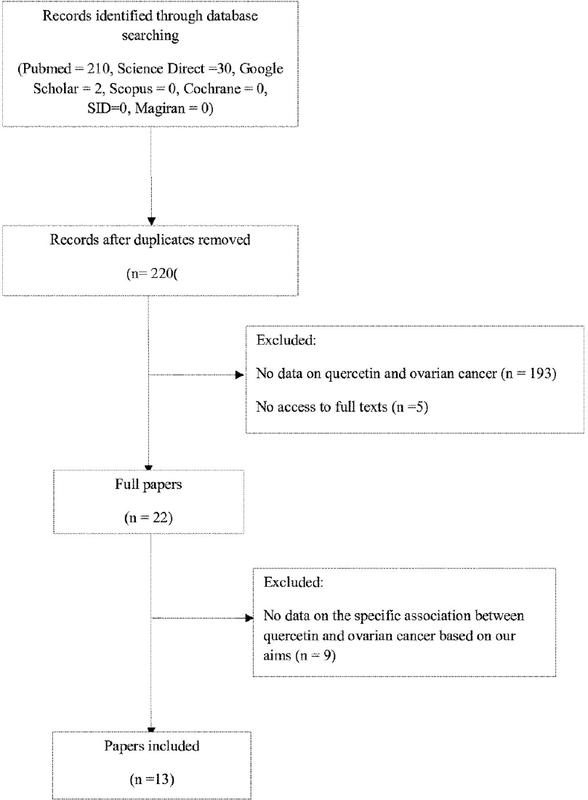 Materials and Methods: In this randomized clinical trial, patients with diagnosed esophageal cancer or any other benign lesions candidate for esophagectomy were selected. They randomized in three groups with three different approaches for gastric pull-up esophageal surgery including esophagectomy with pyloromyotomy, esophagectomy without intervention, and esophagectomy with pylorus buginage. The outcomes of procedures regarding gastric emptying time and delayed gastric emptying were compared. Results: Thirty patients were allocated in three groups. Gastric emptying time was not significantly different in the three groups (P > 0.05). Frequency of delayed gastric emptying, complications and barium leakage were not different in three studied groups (P > 0.05). Conclusion: Gastric emptying time and delayed gastric emptying were not different between common pyloric drainage methods after esophagectomy and esophagectomy without drainage. Background: Little is known about the effects of a low energy dense diet on weight maintenance and cardiovascular risks following a recent weight reduction. Therefore, we assessed if weight maintenance, lipid profiles, and glycemic control differ between low energy density (LED) diet and usual diet consumers following a recent weight reduction. 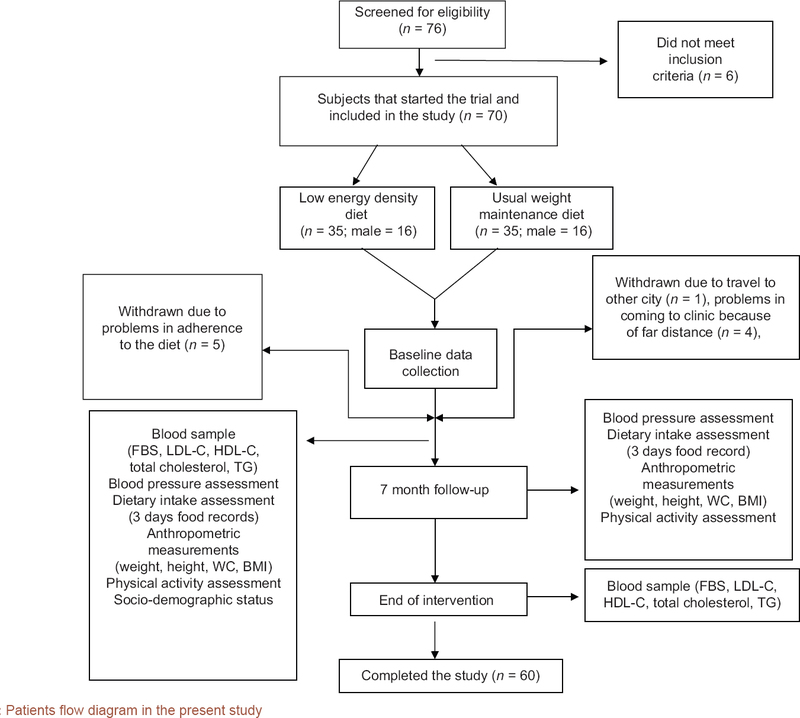 Materials and Methods: In this randomized controlled clinical trial study in a parallel design, we recruited 70 patients with the history of weight reduction in the recent 1 year. LED diet contained 30% fat, 15% protein, and 55% carbohydrate was administered to the test group, and a usual diet including 35% fat, 15% protein, and 50% carbohydrate was prescribed to the control group for 7 months. Dietary intake was assessed by using 3 days food records. Biochemical markers and anthropometric measures were done according to the standard protocol. Results: Weight reduced in LED diet consumers compared to usual diet consumers (−0.3 ± 0.2 vs. 1.3 ± 0.4%, P = 0.002). The results was the same regarding waist circumference (−0.4 ± 0.2 vs. 0.3 ± 0.1%, P = 0.004). Fasting blood sugar also decreased in LED diet group (−9.5 ± 0.8 vs. 0.4 ± 1.0%, P = 0.0001). LED diet group had a drop in percent change of their total cholesterol (−0.4 ± 0.5 vs. 2.05 ± 0.4%, P = 0.04) and low-density lipoprotein-cholesterol (4.8 ± 0.9 vs. −0.3 ± 0.9%, P = 0.002). Conclusion: Our findings confirmed beneficial effects of LED diet on attenuating weight regain in subjects with history of recent weight reduction. It might be derived from higher consumption of fruits, vegetables, and fiber among LED diet than usual diet consumers. Background: Acne vulgaris is a chronic inflammatory disease of the pilosebaceous follicles and one of the most common skin diseases. The peeling method has been recently found to be effective for acne treatment. This study aimed to compare the efficacy of pyruvic acid 50% and salicylic acid 30% peeling in the treatment of mild to moderate acne. Materials and Methods: In a prospective single-blinded clinical trial, 86 patients with acne were randomly assigned into two groups. In both groups, the routine treatment of acne (topical solution of erythromycin 4%, triclorocarban soap, and sunscreen) were used twice a day for 8 weeks. In addition, salicylic acid 30% for the control group and pyruvic acid 50% for the case group were used. In both groups, acne severity index (ASI) was calculated before and at week 2, 4, 6, and 8 of the treatment. Patient satisfaction was assessed at the end of the treatment. Side effects were recorded using a checklist. Results: In both groups, the reduction in the number of comedones, papules, and ASI were statistically significant (P < 0.001) in the course of treatment. However, it was not significant regarding the number of pustules (P = 0.09). None of the number of comedone, papules, pustules, and ASI was statistically different between study groups. Both treatment groups had similar side effects except for scaling in the fifth session, which was significantly lower in salicylic acid - treated patients (P = 0.015). 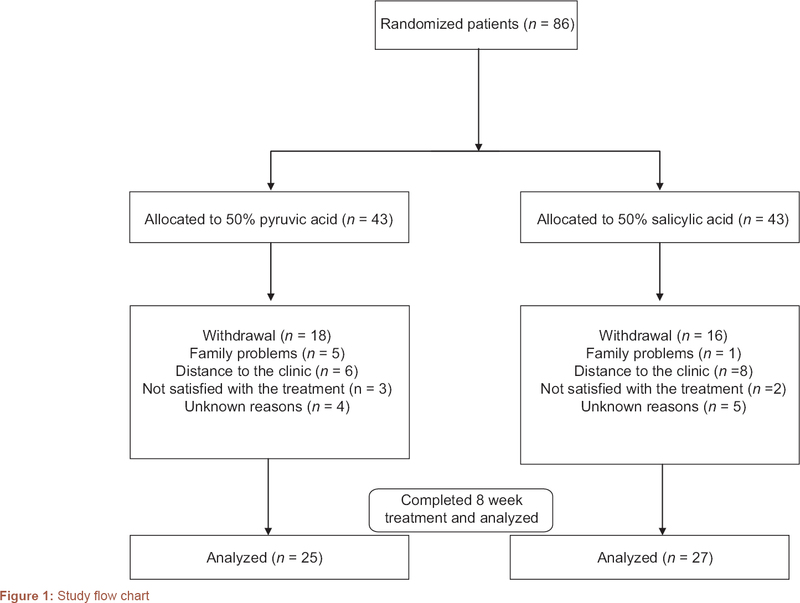 Conclusion: Both pyruvic acid 50% and salicylic acid 30% are effective in the improvement of mild to moderate acne with no significant difference in efficacy and side effects. Background: Various adverse effects of homologous blood transfusion detected particularly in open heart surgery, in which it is frequently used, lead researchers to study on autologous blood use and to evaluate the patient's blood better. Due to the complications of homologous blood transfusion, development of techniques that utilize less transfusion has become inevitable. We aimed to evaluate the effects of acute normovolemic hemodilution (ANH) in patients undergoing open heart surgery. Materials and Methods: In this study, 120 patients who underwent open heart surgery were included. Patients were grouped into three: Autologous transfusion group (Group 1), homologous transfusion group (Group 2), and those received autologous blood and homologous blood products (Group 3). Patient data regarding preoperative characteristics, biochemical parameters, drainage, extubation time, duration of stay at intensive care, atrial fibrillation (AF) development, and hospital stay were recorded. Results: A statistically significant difference (P < 0.005) was found in favor of autologous group (Group 1) with respect to gender, body surface area, European System for Cardiac Operative Risk Evaluation, smoking, hematocrit levels, platelet counts, urea, C-reactive protein levels, protamine use, postoperative drainage, frequency of AF development, intubation period, stay at intensive care and hospital stay, and amount of used blood products. Conclusion: The use of autologous blood rather than homologous transfusion is not only attenuates side effects and complications of transfusion but also positively affects postoperative recovery process. Therefore, ANH can be considered as an easy, effective, and cheap technique during open heart surgery. Background: Emotional intelligence (EI) helps humans to perceive their own and others' emotions. It helps to make better interpersonal communication that consequently leads to an increase in everyday performance and professional career. Teaching, particularly teaching in the clinical environment, is among the professions that need a high level of EI due to its relevance to human interactions. Materials and Methods: We adopted EI competencies with characteristics of a good clinical teacher. As a result, we extracted 12 strategies and then reviewed the literatures relevant to these strategies. Results: In the present article, 12 strategies that a clinical teacher should follow to use EI in her/his teaching were described. Conclusion: To apply EI in clinical settings, a teacher should consider all the factors that can bring about a more positive emotional environment and social interactions. These factors will increase students' learning, improve patients' care, and maintain her/his well-being. In addition, he/she will be able to evaluate her/his teaching to improve its effectiveness.